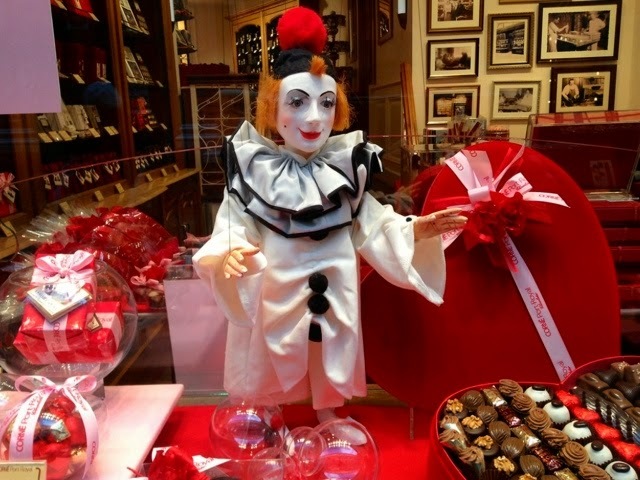 I arrived in Brussels Thursday for their Salon du chocolat. How did I forget it was Valentines. 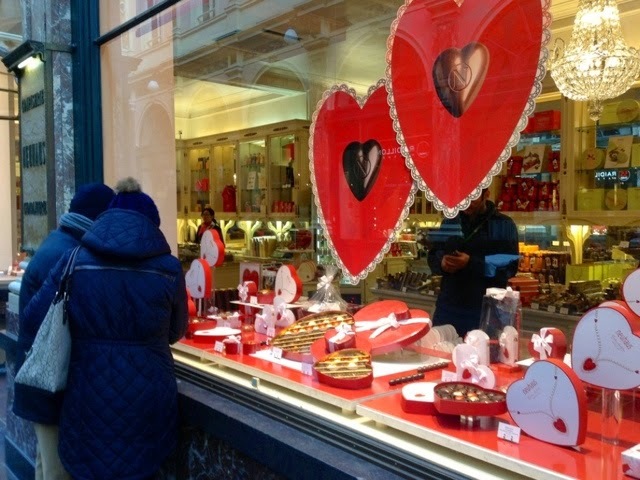 Brussels' chocolate shops did not. They were ready to entice. Elaborate marionettes fill many candy shop windows. Elaborate is a good word to describe Brussels' displays. 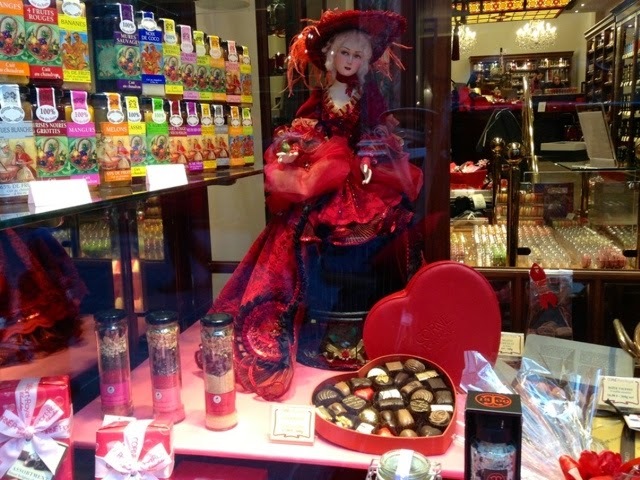 Mary Chocolat celebrated Valentines with big red painted bows. 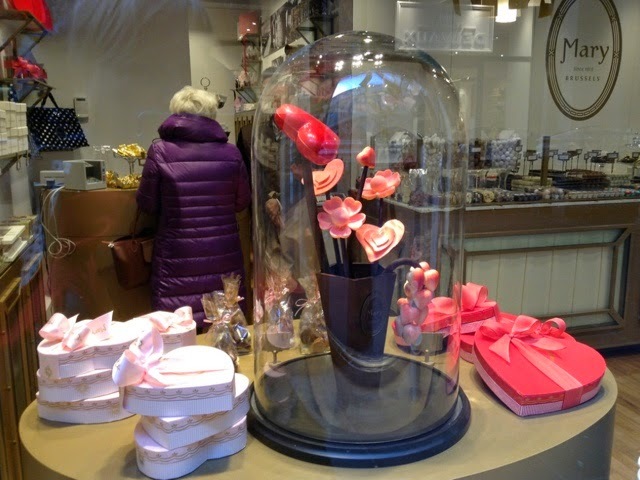 Inside delicate pale pink heart-shaped boxes and loads of satin ribbons. 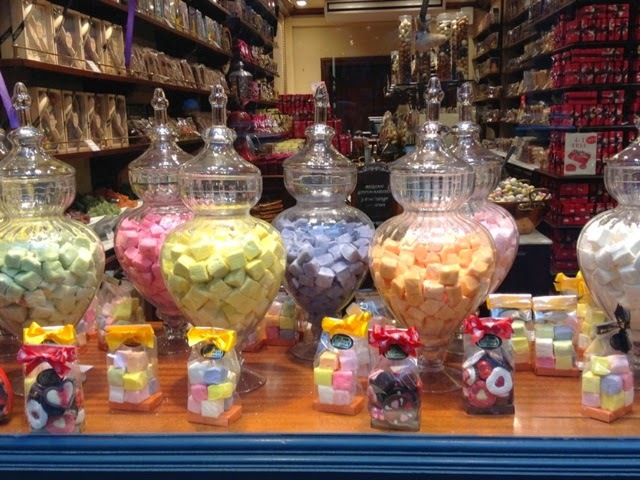 A wonderful excess of guimauve(marshmallow) makes my heart beat faster. 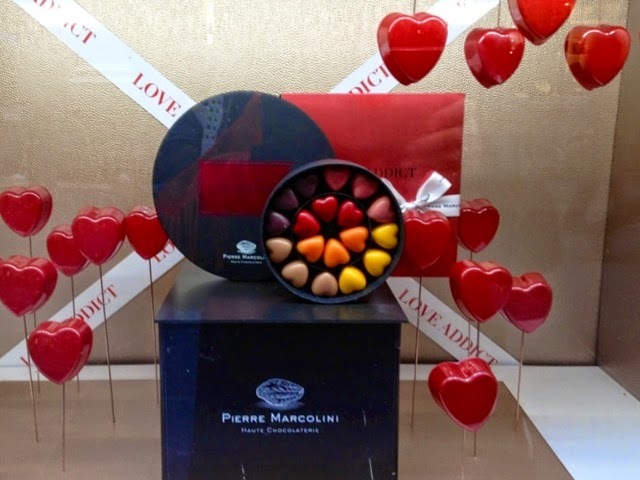 Pierre Marcolini, as always, the more restrained and elegant of Belgian chocolatiers. 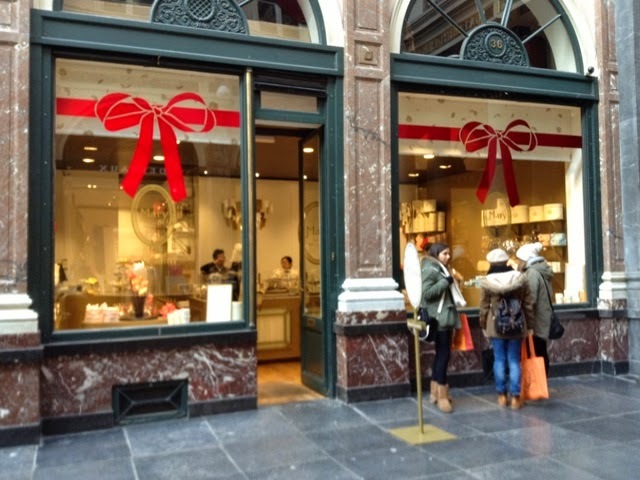 The best place to see many fine Belgian chocolatiers is the Galerie de Reine, speaking of elegance. It was early morning so not crowded. A massive heart from Corne-Port Royal. I prefer my chocolates identified and described in detail. Remember Whitman's Sampler with the details on the back of the box? Of course you never went down, like a mouse, early morning to raid the chocolate box drawer. Taking bites out of this and that chocolate searching for a caramel. No never. 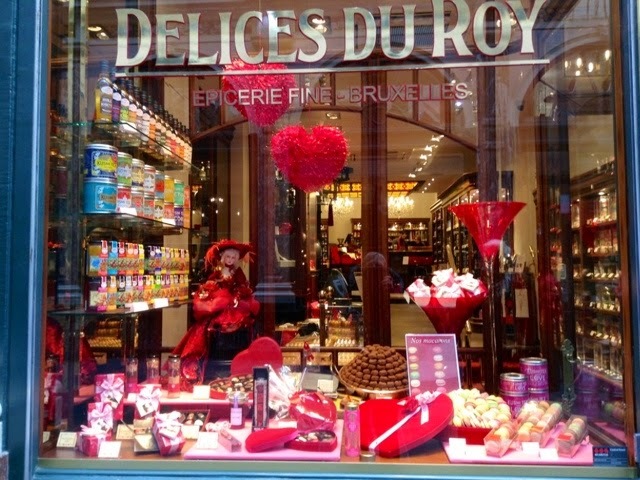 Red velvet heart boxes are everywhere in Brussels and all sizes. Leonidas has a smooching Mini on their boxes. The tall tin Belgian house is another favored candy container along with the cone. 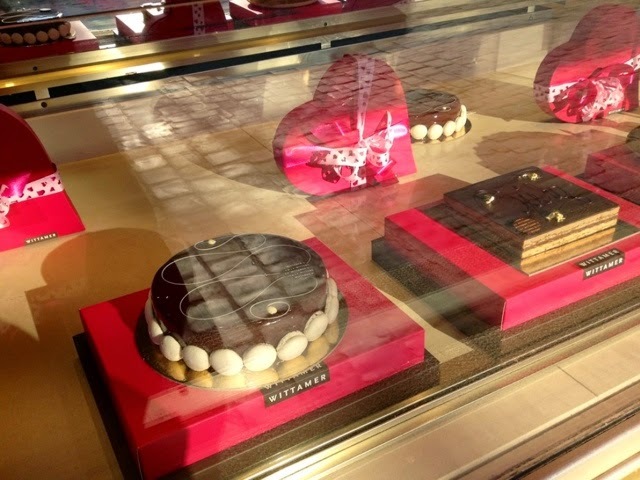 I went out of my way to visit the famous Patisserie Wittamer (pronounced Wit-A-Mare) in the Grand Sablon. Big disappointment. Empty and the atmosphere inside as chilly as it was out. They had standing tables but you must take your hot chocolate outside(emporte) or go up to the tea salon next door. Frankly I couldn't be bothered. I was so impressed by them at the Paris chocolate salon in 2008. and again at the Brussels Salon Thursday night. Exquisite in everyway taste-wise and packaging. Do visit their website and sign up for their delightful mailings - truly a joy to receive. Next time I'll visit Debailleur instead! 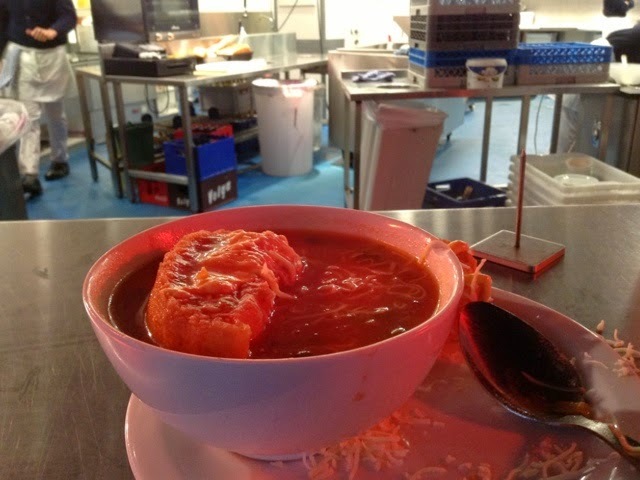 I'd like to send a great big valentine to De Noordzee at Saint Catherine for their fabulously warming, delicious soupe de poisson (5€). They serve all day and night sans cease. I saw soup-eaters next morning slurping happily. That's a hunk of garlicky toast with grated cheese plus a squiggle of mayo of all things afloat in the bowl. You stand at the counter outside in the bitter cold. No tables or chairs. Yet the staff could not be more friendly, happy to explain the dishes. Food is served instantly. 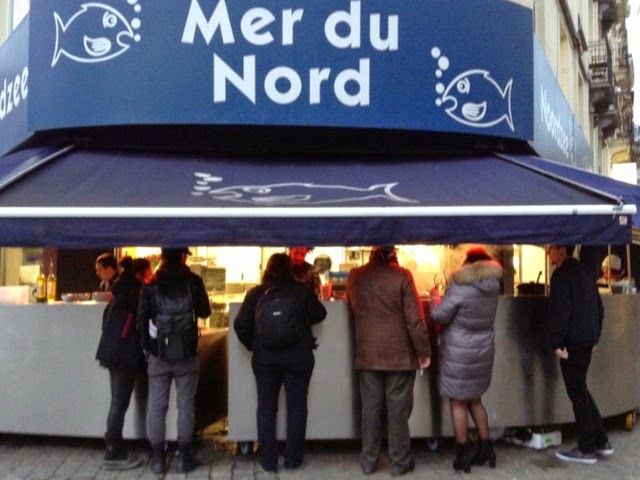 Their fresh fish counter is to the right. Naturally I felt a mad attraction to Belgian red postboxes even if somewhat defaced. If you'd like to give your true love (or yourself) a Valentines gift of Sketch letters I can easily scan February's monogrammed art. You simply print it out to deliver on the 14th. The letter will arrive from Paris soon after. 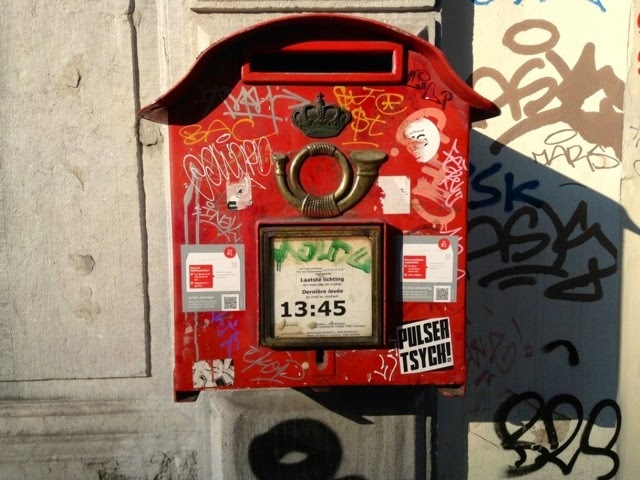 After all that elegance and excess, love seeing the messed-up red Belgian postbox. Back to realite. The standup outdoor seafood place is a hoot! Noordzee is soo much better than the pretentious Aux Armes de Bruxelles. Rude waiters and you had to pay for water. Empty shells in tthe moules marinere! Ridiculous prices to boot. Oh wow! Debailleul is soooo chic! I didn't know it before, I love their packaging! You would Love their little booklet catalogs! 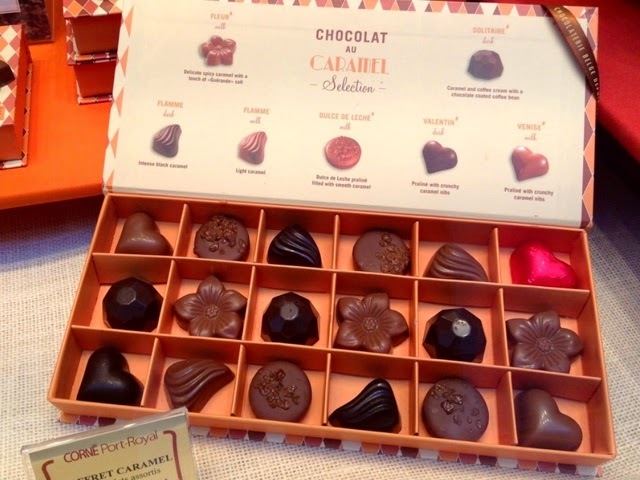 Beautiful packaging..like treasures those chocolates are. 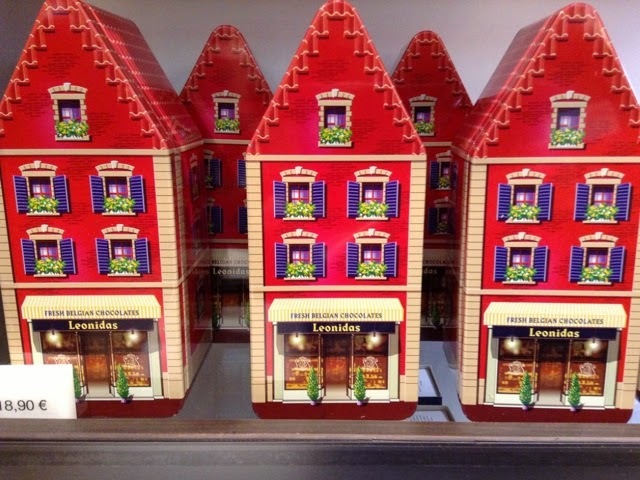 Also find the house boxes très cute too. I got 2 little exquisite boxes. I wanted everything they had! Thank you for helping to make my life so much fun.....living vicariously in Paris (and about) with your darling posts. In my fantasy world, you spend an entire year going from Chocolate Show to Chocolate show. Surely there is at least one Chocolate show going on somewhere every day! There probably is a chocolate salon on this minute(in Brussels) but one does have ones limitations. I could look at the packaging forever. Thankyou Carol. Your blog allows me to see a Paris that I didn't take a lot of notice of before whenever I visited. Belgian chocolate? - of course it's just over the border. Your blog is the first thing I look at when it shows up on my computer. Love it so much. from Gwendoline in Australia. and so then she hops off to Brussels. I LOVE it! Thank you for taking us along. I think I'm totally in love with the tin Belgian house, too. 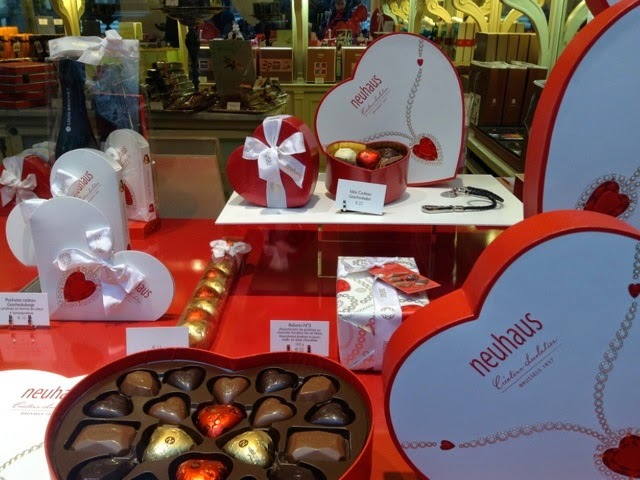 Isn't it amazing how the chocolate stores look more like jewelry stores? You really outdid yourself with the photos today! Maybe it was all of the Valentine reds jumping out at me? Gorgeous shots, like the Galerie de Reine! 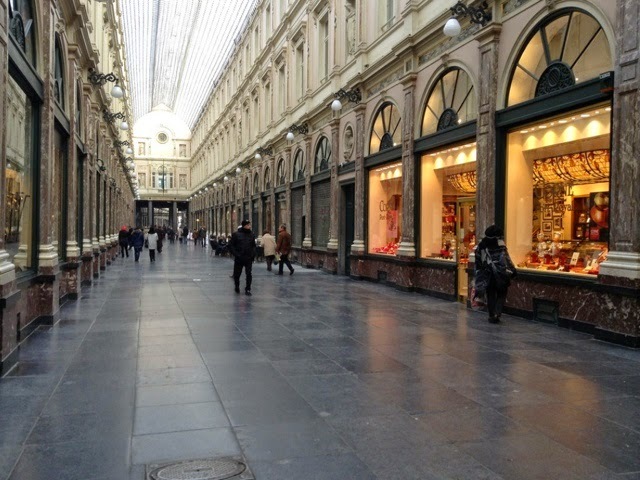 So much eye candy in Brussels you're satiated without eating! Happily dazzled and wildly in love with PB and all the joy of today's post! Sigh. 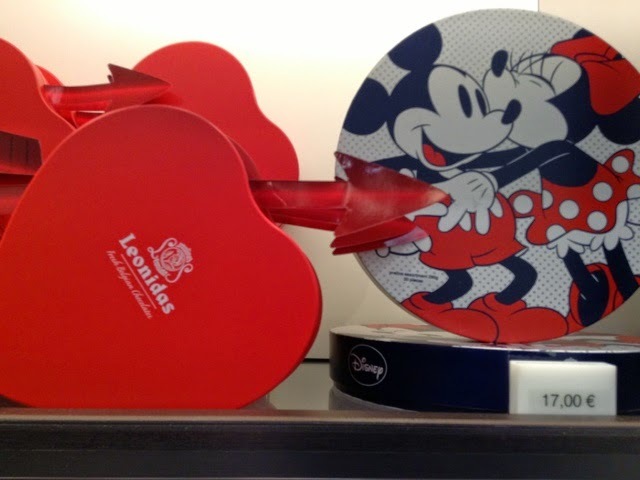 Oh, to be in love in Paris at Valentine's day. Or even, not -- just in Paris! What exquisite photos! 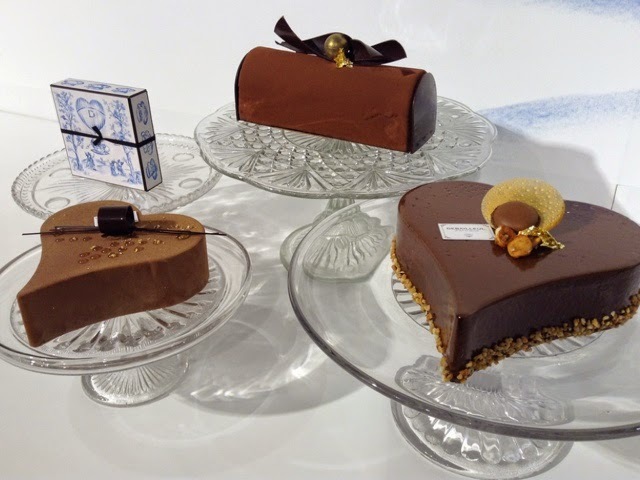 I visit Brussels frequently for opera, but always, always shop for chocolate. 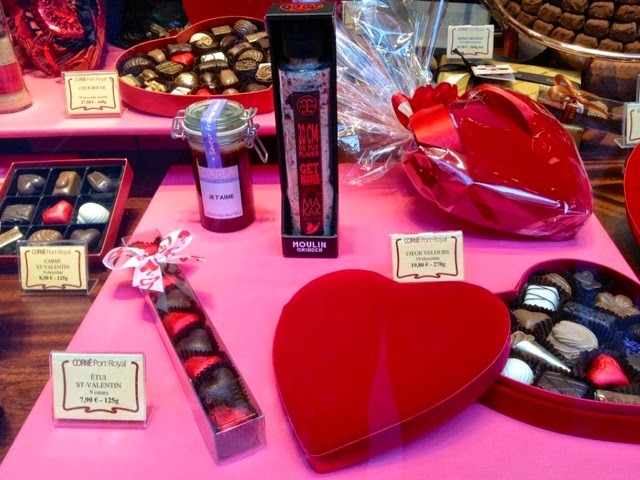 My favorites in the Place du Grand Sablon are Wittamer (the ladies in the chocolate boutique are always lovely when I chose my little sachet, I never visit the tea salon) and tiny Passion Chocolat, just up the hill, with their wonderful crimson packaging. Marcolini takes itself a bit too seriously, and Godiva, Neuhaus, and Leonidas aren't worth the calories. Mary is good, as you know, and Frederic Blondeel, at Ste.-Catherine, makes the perfect dessert after Nordsee. Next time I will seek out the Debailleul factory store, thanks for the tip. Oh I wish you'd been along Chanterelle. I had the most enormous cup of hot chocolate at Frederick B. Couldn't even finish it. A first! Delish of course. The last time I was in Brussels I remember freezing too. Just as well the hot chocolate is easy to come by - as well as the chips and mussels! 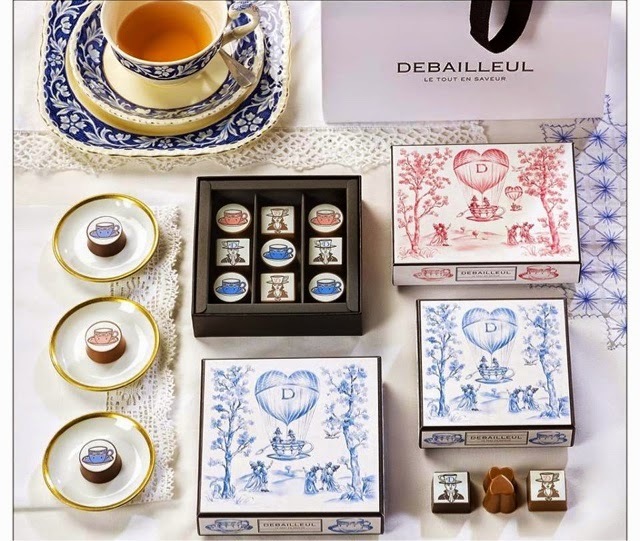 Wonderful array of chocolates - Debailleul sounds interesting too. Love the sound of that fish soup stand with all the trimmings. Sounded great fun! Every shop sells hot chocolate thank goodness! A life saver!! 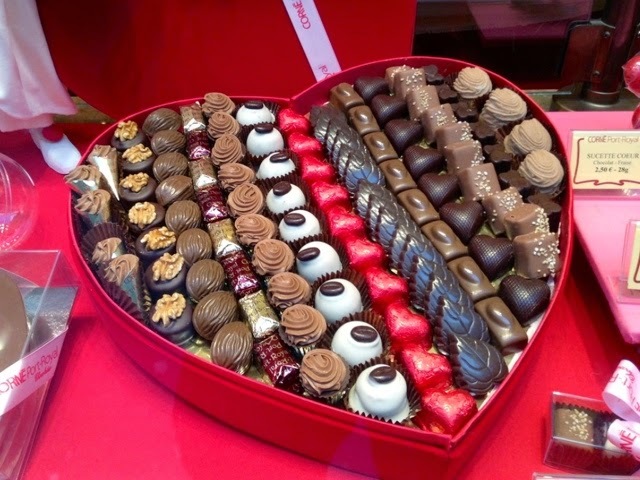 OK...I will get myself a small box of Valentine Chocolates and take myself for lobster bisque at Neiman Marcus. I love stopping by to see what you have on the blog. You take me to places that I probably won't visit (I am not a big fan of flying) and show me wonderful pictures along with some watercolor. Thanks so much for the tour. Red red red everywhere in this post, and in all of France, no doubt. Your eye with the camera is just as selective and elegant as your water colors, Carol. Thanks for making my day so colorful. Thank you for letting me experience the seasons of Paris through your eyes.....I can't tell you how much I long to live there. Maybe someday.